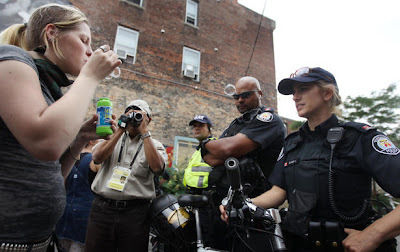 The Twain Shall Meet: G20 Protest ~ January 8, 2011 ~ Queens Park! Do not let Officer Bubbles Here, get the best of us. He is far from the best of us! The deliberate act that this so-called police Officer was talking about was this! If you can get there, get there. If you can't, Please help spread the word! Mass Demonstration Calling for Public Inquiry into G20 Summit on Facebook. The narrator is a bit dull, but he is not a professional, he is just a concerned citizen who has been forced to mobilize under the unprecedented oppression of the G20 Security Forces. 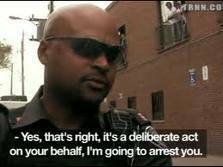 He is now being harrassed on a nearly daily basis and was at one point targetted and detained by 11 police officers right outside his own front door and accused of all things, Loitering? It's near the end of the video. In spite of the Winter weather some 200 did in fact turn out! There were speakers and eventually the group marched to Police headquarters chanting "Bill Blair has got to Go" and "We Will Not Forget". If you have other videos or photos, please let me know! And of course you can comment below! This video was sent by Aquataine through the comments section below. The G7, G8 and G20 should be meeting inside the UN building NOT in Toronto! This elite, Invite Only club, should certainly NOT be paid for on the backs of the working poor who have once again had their Rights violated. I would love to be at the Rally myself but I will have to settle for being there in spirit.The Charter of Rights and Freedoms must be Honoured! Thanks for this info Kim. I look forward to updates to whats going on with this story. ps You are welcome for the phone call about the year. Talk again soon. Good work Kim. I wrote a piece about the Jan 8th Rally At Queen's Park To Demand A Public Inquiry into Police Actions During G20 Toronto and posted it on Tumblr in my Son-of-a-Beekeeper blog. 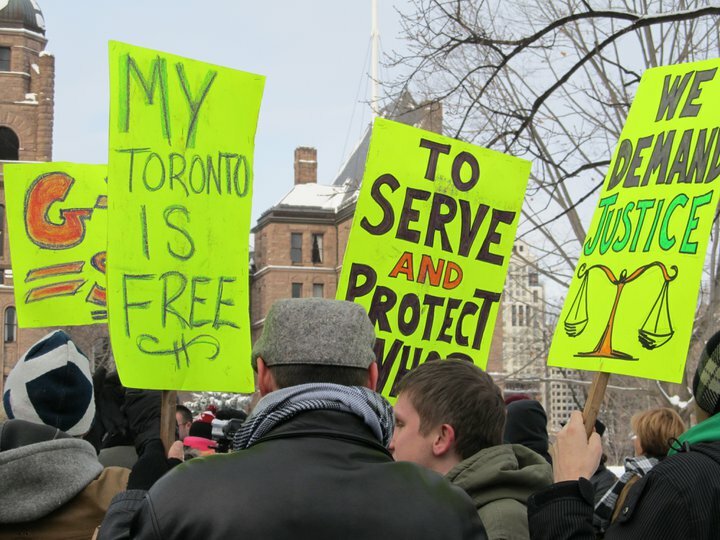 I put the best of my own original pictures and videos there, but the best image I've seen so far is Michael D'Amico's picture of Adam Nobody at Queens Park, Jan 8th 2011 where he is seen in the protest, out front of the Queens Park bldg in downtown Toronto. Thanks Again Geraldine, I agree! Thanks Aquataine, I published that video above! The Hawk is certainly an interesting guest! Thanks roberrific, I went to Flickr and saw the Picture, but it like all Flickr photos has been deemed Copyrighted. Read my comment there. It was a typical Yahoo experience just to get a comment up. Yahoo is a good word for the way they handle security. I left a note that may get me a copy of that of that pic though. But only if the stars align just so and if I hold my tongue just right. Lol!